For Bell & Ross, it has always been about watches that tell stories, recall bygone eras, and cherish the value of timelessness. Its passion for military history and its airborne heroes, tied to extraordinary tales of human and aviation adventures has always transpired through the watches worn by the pilots and crew, as their extreme audacity, tenacity and constant drive push the limits of man and machine. With the Heritage collection launched in 2009, Bell & Ross pays homage to the Golden Age of Flight between World War I and World War II, and, more specifically, the military aircraft instruments from the 1940s – aircrafts that enjoyed humble beginnings from the imagination and the wood-and-fabric Wright Flyer plane, to today’s cutting-edge Dassault’s Rafale fighter jet. Unveiled in 2009, the Instrument BR Heritage was created to breathe new life, and revive the authentic spirit of antique timepieces, keeping the aged appearance of the dials and straps, but built with the most modern and high-performance watchmaking techniques. 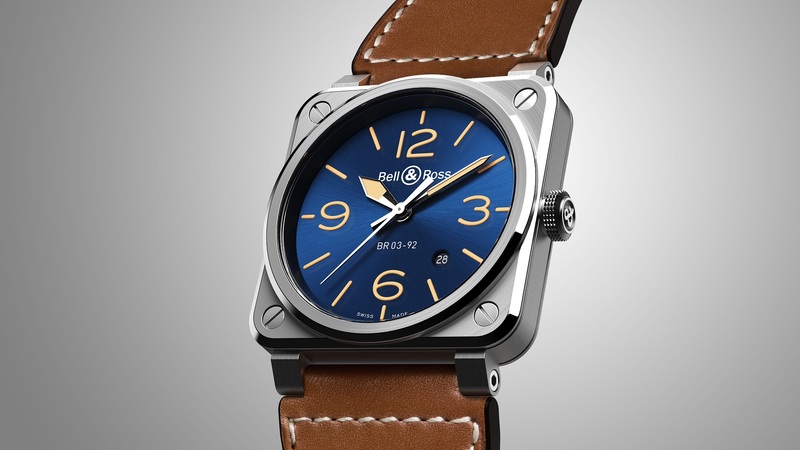 True to the definition of heritage as “something transmitted by, or acquired from a predecessor”, Bell & Ross followed this up with the BR 03 Golden Heritage in 2013, retaining the retro elements of the 2009 timepiece, with updated golden appliqué numerals and indexes, a brown dial surface that bore subtle marks of wear, as well as a satin-brushed steel case. Commemorating the 10-year milestone of the Heritage collection this year, the new BR 03-92 Blue Golden Heritage keeps the best of what made the Golden Heritage the ideal combination of past and present, fitted with a more contemporary take via the unique navy-blue sunray dial. The contrast between the gold and blue colours offers a refined air and excellent legibility, further enhanced by the three-hand model with central seconds and a date indicator. Limited to 120 pieces, the square satin-brushed 42mm steel case comes with a calfskin strap with hot stamping and a black heavy-duty synthetic fabric, which, seen in previous models, will take on the owner’s “signature” over time, and form a unique patina.